Happy Earth Day! Well we have had better and worse days weather wise for Earth Day. It’s cloudy and rain is coming this afternoon. But that won’t stop me from writing this post and being more mindful of my effects on the earth. 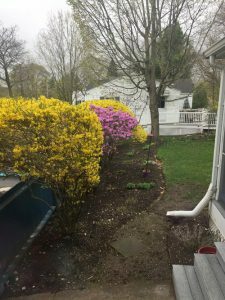 I thought I would share pictures of my spring garden as it slowly comes to life. 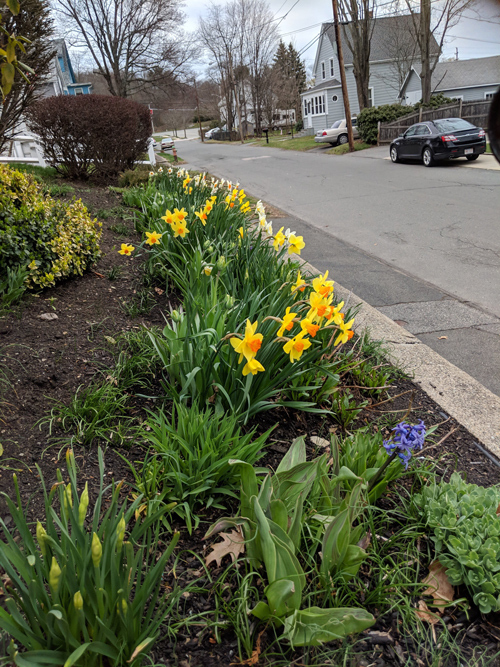 My bulbs are dancing in the wind. My flowering shrubs are glowing this year. I would love to think I had something to do with the glow but a quick drive around town and I see this year most flowering shrubs are vibrant. 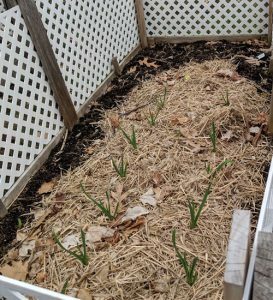 One of the exciting things happening this spring is my garlic. My son and I planted these babies back in early November. I never tried growing them but they are peeking up and making me happy. I hope now I can get them all the way to harvest. 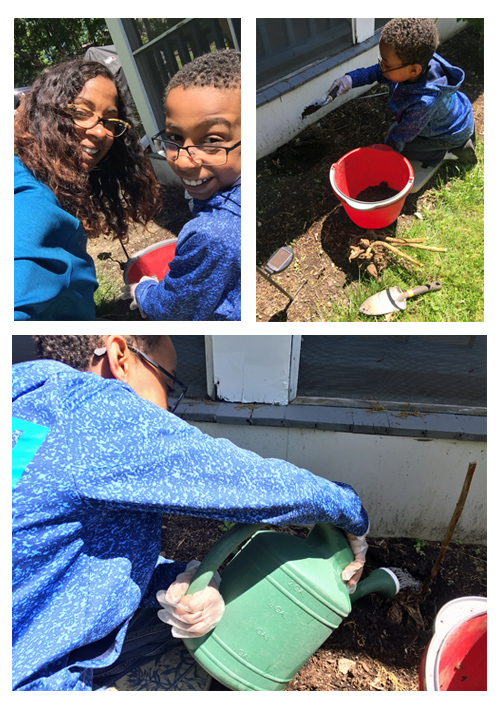 Well I didn’t include any Earth day links this year but I do want to mention that even growing a few vegetables you typically eat in your garden is helpful for the earth and of course, yummy for your tummy. Using recyclable bags for both food and clothes shopping helps. Each year, learn new ways to help our planet. It’s just a shift of mindset. The weather was so warm two weeks ago, so I had to get out there and begin my spring planting. Apollo was my helper when it came to planting my Dahlia bulbs. He likes digging and he really loved playing with all of the worms we encountered. When he finished with me, he took some time to play with his dad! He has had these since he was really little but he is really too big for them but it was fun watching them ride around the driveway! 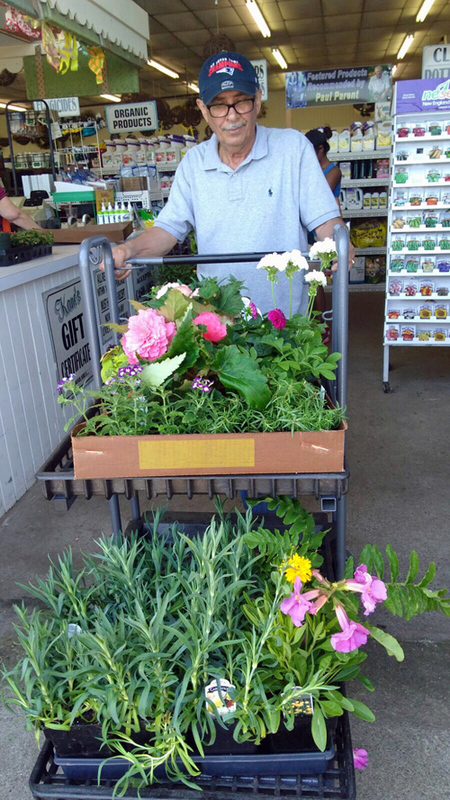 Every year, for some time now, I take my father-in-law plant shopping for his father’s day gift. 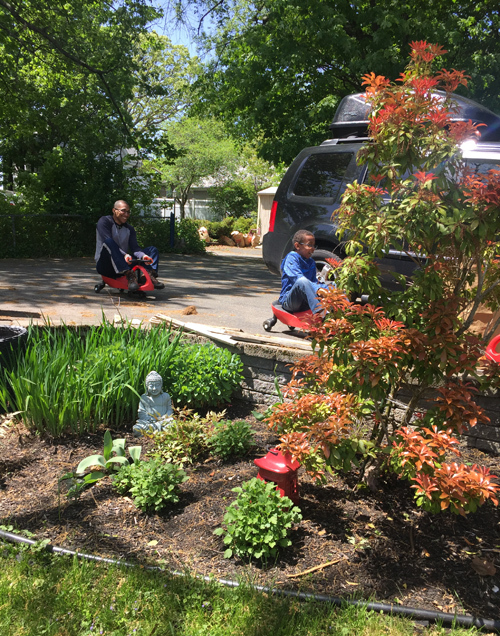 We learned a few years ago that it’s better to go right after Mother’s day to get the best plants. So off we went, I didn’t go with a plan. 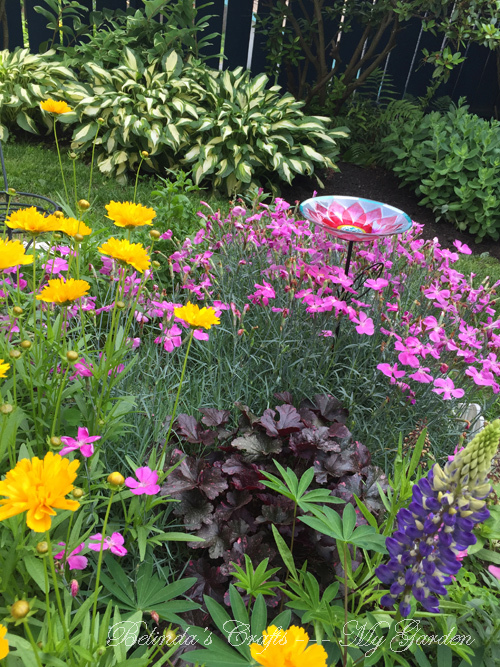 I just browsed but I bought much more perennials which really makes me happy since they will return each year. I also began buying some vegetable plants for my veggie beds. 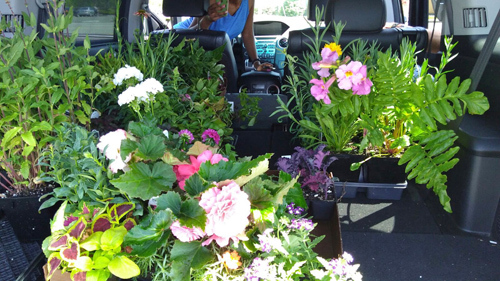 The day we went shopping it was in the 90s so we went shopping early and I waited until Saturday do my planting. I managed to get a good start but much more to do. My wireless headphones broke so I need to find another inexpensive option to use when I am out in the garden. 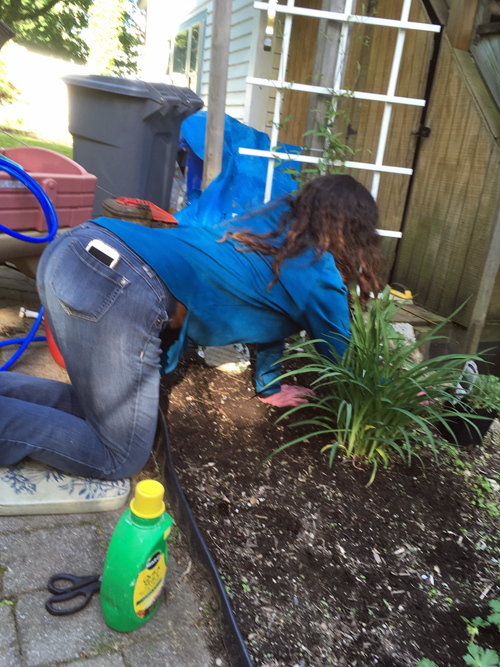 I like to listen to my audiobooks and podcasts while I mess around in the garden. Last year, I learned the hard way using headphones with wires and I accidentally cut the cord. Yup, it happened. So Bluetooth all the way. I am hoping to get out in the garden later today to continue work in the garden. Have a fantastic weekend! One thing I do all summer is try to find interesting angles to take photos in my garden. 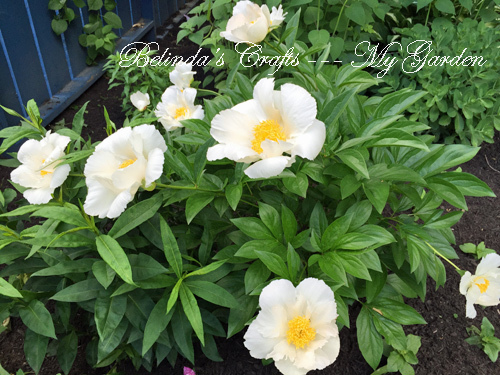 I love my flowers and I have always enjoyed seeing how different angles change the experience of a photograph. 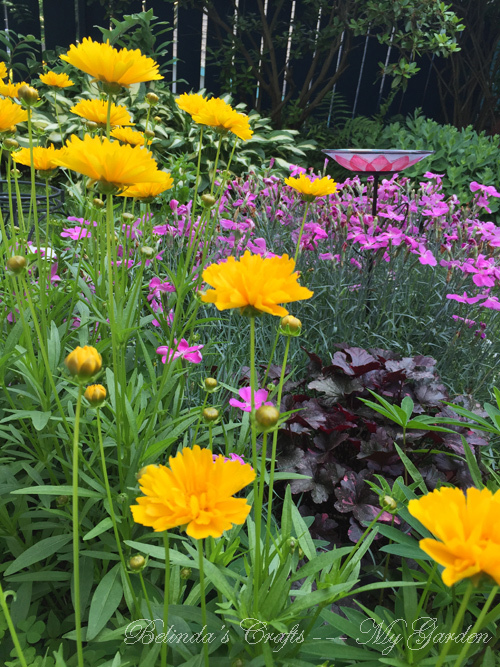 The yellow of the coreopsis make me do the happy dance every time I see them. I love the contrast of the deep purple of the Heuchera. It makes the yellow really pop. I just love these photos so I thought I would share two today.